Today is my birthday! So I sewed a dress! I’m the ripe YOUNG age of 40! Each year for the last handful of years, I’ve sewn a dress for my birthday (last year’s was my sweetheart cowboy dress). This year, I knew I wanted to make the dress a little bit more special, because of our trip. And I’ll hopefully be posting photos of me wearing this today on my Instagram, so keep your eyes peeled if you follow me there! Before I get into this dress, let me pause for a second to say these are the first photos I’ve taken in my sewing area! It’s definitely not the best—I mean, this is a basement, folks. Lighting is whatever natural light comes in two windows, and then mostly fluorescents above me. And it’s a pretty busy background to boot (in fact I moved one of my bins around halfway through the photos, ha ha). But hey, I love the space and the dress just seemed to fit in, so I went with it. I promise eventually I’ll show off the space properly once I consider it more “done”. It’s getting there. Right, back to the dress! 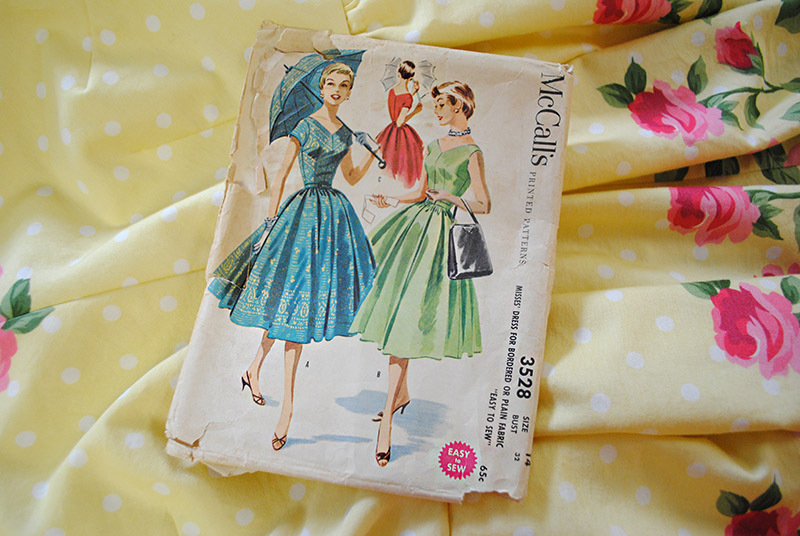 I picked a vintage pattern I’d never made as a dress, but I’d made it into a skirt, McCall’s 3528. I wanted to use this gorgeous cotton sateen border print from the Gertie by Gretchen Hirsch line of fabric at JoAnn’s. I think this print is from last year. 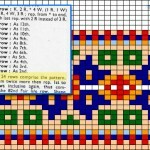 It actually has two borders which is wonderful, as it means you can play with them in different ways! I knew right off I wanted to use the narrower rose border on the bodice neckline, but that meant cutting the bodice on the bias. Not such a big deal, right? As I mentioned I’ve sewn the skirt from this pattern before, my Doctor Who skirt. It’s literally 4 yards, pleated and gathered. The sateen isn’t quite as stable as a firm medium weight cotton, and it’s a bit drapier and slightly thinner. The idea of that skirt hanging from a bias-cut bodice sent chills down my spine, picturing it streeeetching out of shape slowly but surely. Not on my watch. I knew I was going to line the bodice, but I wasn’t sure if even cutting that on-grain, would it be stable enough? Because the skirt is still only sewn to the bodice, and then the lining hand stitched at the waist seam, so it provides some stability but I didn’t think enough to hold up 4 yards of fabric. Even if I used a waist stay I just worried about the bodice supporting the skirt. I mean damn, that’s a lot of skirt. I hemmed and hawed for awhile and finally decided to underline the bodice with cotton batiste, but with the underlining cut on-grain, effectively removing the bias aspect from the bodice. 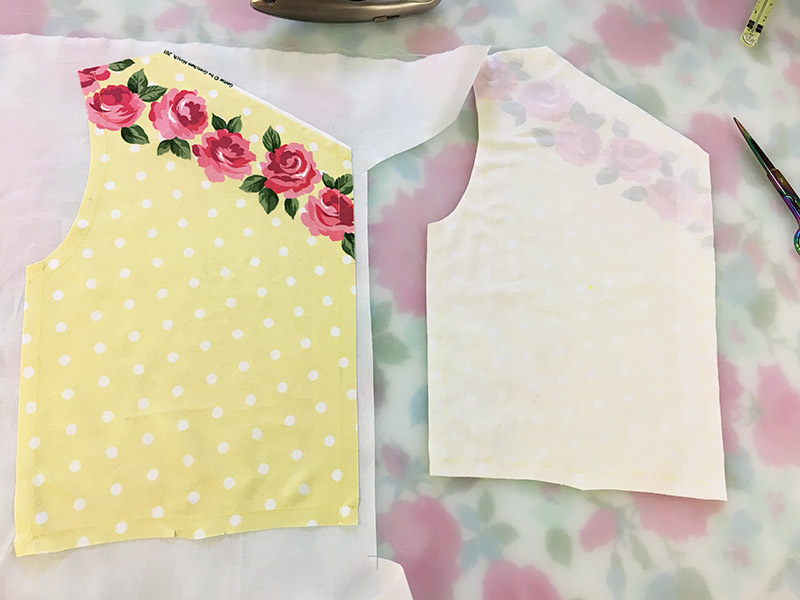 Sometimes you cut on the bias to take advantage of the bias, but in this case it was to take advantage of the print only (in fact I did my muslin with the fabric on-grain too). I figured this was a good move, if unconventional. 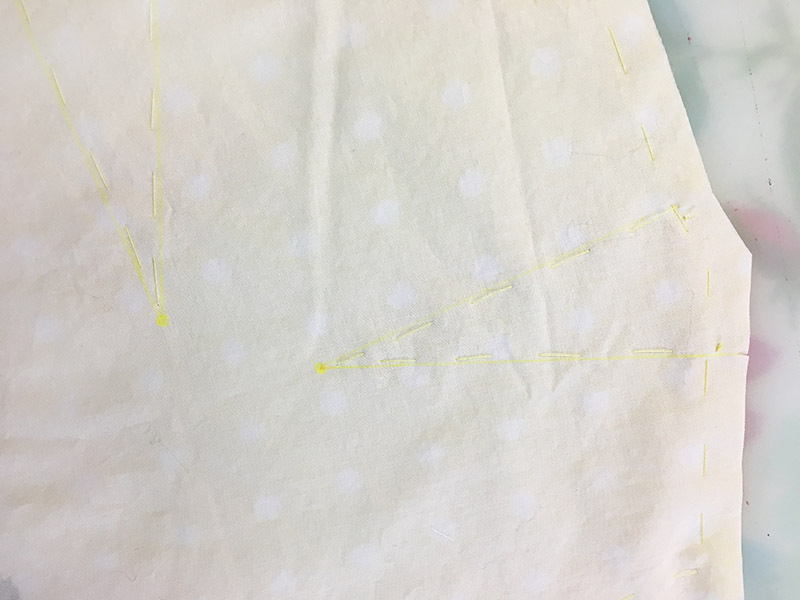 Then I decided to still line it because that was my intention from the get-go (the fabric is just slightly sheer), so I’d already drafted the cut-on facing out of the bodice pattern pieces, and frankly I wanted to do it still because I’m stubborn, that’s why. So to get all this bodice precaution situated, first I used fusible stay tape on both the v-neck front and back neckline and center back where the zipper went, all on the main fashion fabric. Then I stay stitched every single seam on the bodice front and back, again on the main fashion fabric. Then I hand basted the underlining to the bodice pieces so I didn’t stretch them out at all. 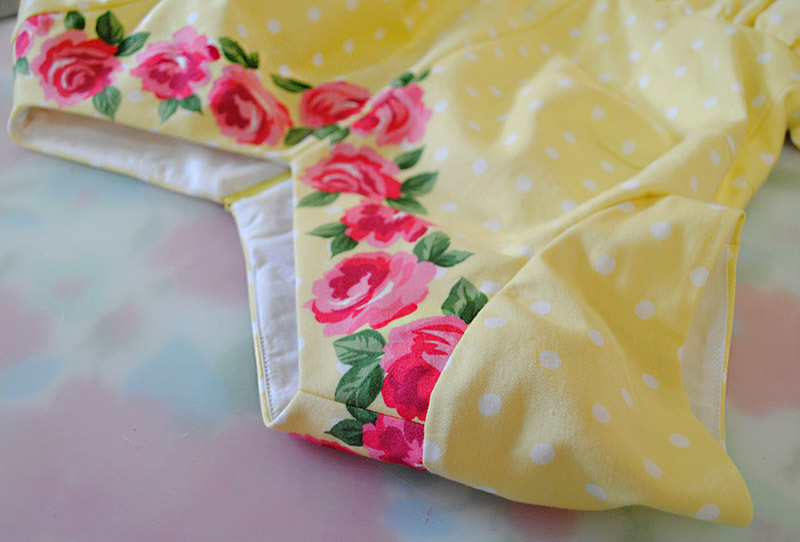 I laid the bodice pieces on the batiste, basted by hand, and then cut the underlining out. On the left below is a piece being underlined, on the right a piece that was already underlined and cut out. And then I basted through the inside legs of each dart so I’d make those nice and precise. It helps a lot! All told, a lot of prep work. Phew. And I don’t know, maybe somewhat unnecessary? But whatever, I did it anyway. Next time if I wanted the bodice on the bias again, I’d probably just underline it on-grain and use facings and call it a day. But since it’s still this time and not next time, then I lined the bodice with the same cotton batiste as I underlined with, which is a bit thinner than I’d usually go for a bodice lining but I didn’t want to add more bulk. You can juuuust barely see it in the photo below but I did something a little tricksy for the sleeves: I sewed the sleeve hem along with the batiste, understitched and turned up the batiste (so wrong sides facing), then set the sleeve in with the batiste and fashion fabric treated as one. So kinda underlined, kinda lined? When you’re calling the shots, you can do whatever you want! Overall, I’m pleased with how that all turned out although it was quite a chore for the final look. In the end, the only fitting complaints really are minor: the center front darts that I already lowered could be even lower, and the bodice could fit a bit better around the armholes compared to how I think I remember it fitting in the muslin. But whatever, I’m chalking that one up to all the hooha I went through on the bodice, 3 layers of fabric and the fact that at the last second I had to take the center front seam in 1/4″ from the top to a few inches away from the waist because of an errant leaf that was stupidly placed. And it still fits way better than most RTW anyway. Other details? I did a centered zipper in the back. I never do invisible zippers, and thought a lapped one would look strange because of the V neckline, and I didn’t want to do a side zipper like the original pattern. I do like a good centered zipper, too. I added side seam pockets! It’s a weird thing, me and pockets. For ages I put them in all my dresses, and then I just stopped because I rarely used them. 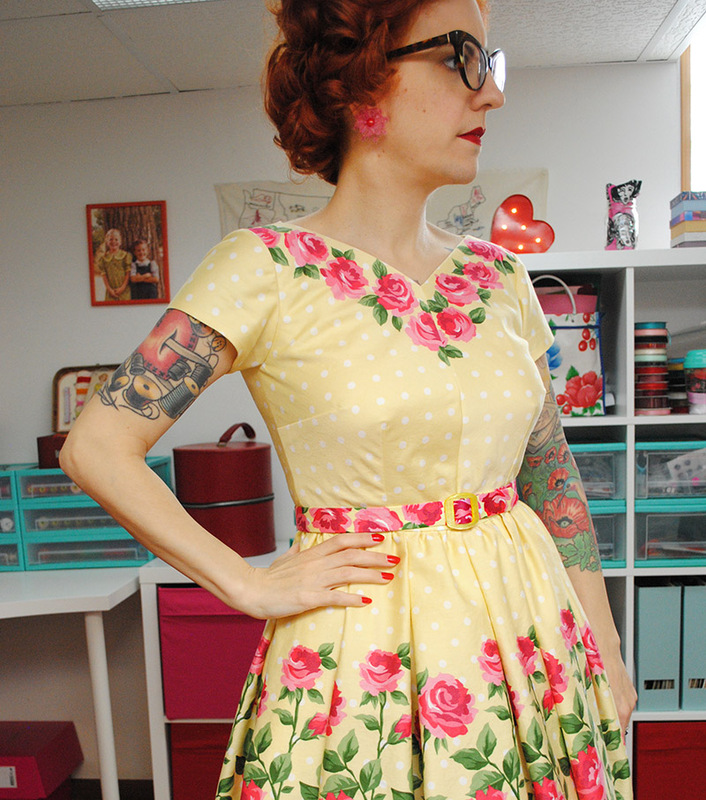 For some reason though this year I’m all into adding them to dresses again, and I’ve sewn 3 dresses this spring (oops, this is the 3rd sewn but the 1st I’m sharing) and all have pockets. Pocketsesssss. And I went all out and also made a matching belt! That’s something I rarely bother doing. Like, almost never. 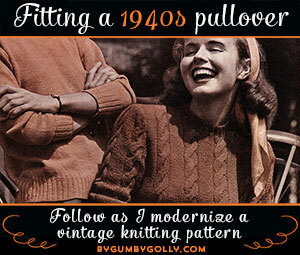 I used a vintage buckle in my stash and 1″ belting that I fortunately had on hand too, since making a belt was something I decided on after I’d already started the project. 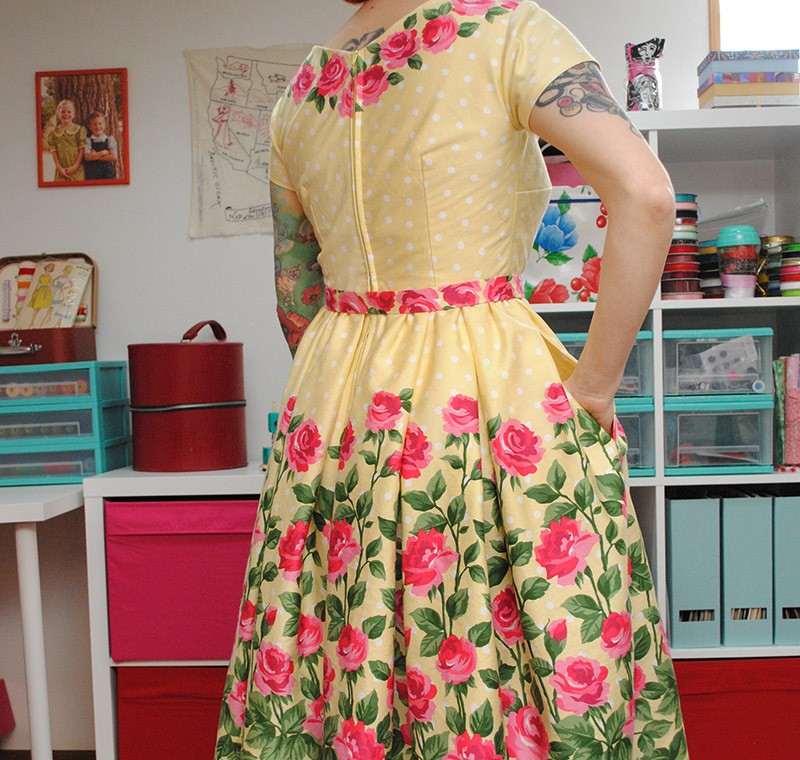 I used damn near every inch of 4 yards of fabric to create this dress and had literally JUST enough of the narrow rose border print for the belt. I absolutely love how it breaks up the polka dots and ties everything together! 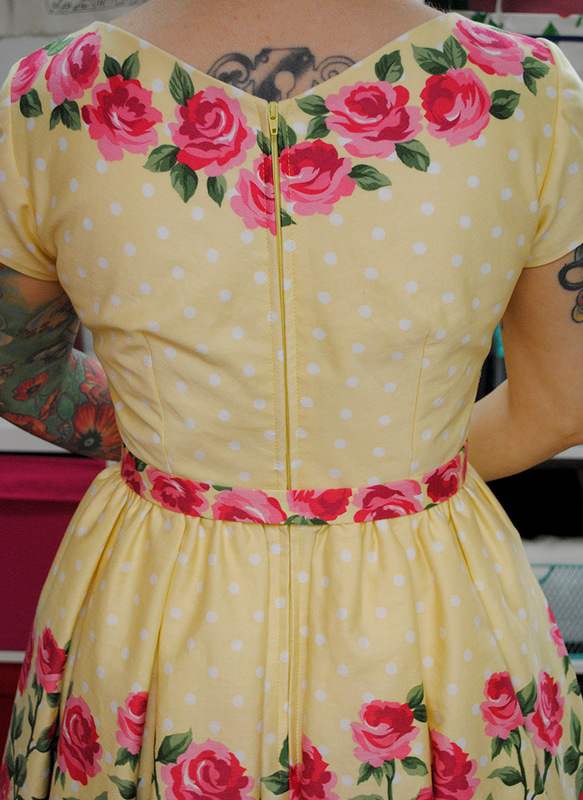 It’s just the perfect finishing touch on this dress! So, as you read this, I’m probably wearing this dress right now frolicking around London shopping and having a luxurious champagne afternoon tea. What better way to spend my birthday?!! What a gorgeous dress!! I love the idea of making a dress every birthday. This dress makes me wish I could wear yellow!. Way cute! Awesome! I fear bias cut projects, especially with slippy materials. Good call on underlining with something stable. It looks so spring like and happy. That is such a beautiful dress! Perfect for a special birthday! I hope you’re enjoying your day! Happy Birthday young lady! I’m older than you so I can say that ? You look beautiful in this color and I love how the dress turned out, the belt makes it perfect. And your sewing area is great. I’m very envious ? Happy Birthday and what a fantastic, simply gorgeous dress. Simply love the border print fabric. The end result is definitely worth all the preparation. Well done. Absolutely stellar!! It looks lovely on you and is the perfect t dress for Sketch. Happy birthday! Such a beautiful dress – had to leave a comment! Such a beautiful dress – just had to leave a comment! Birthday congrats! 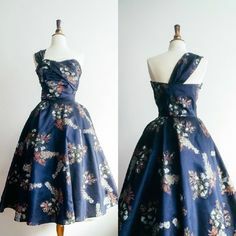 🙂 And lovely dress; the placement of the flowers on this dress great! Happy Birthday! That dress is gorgeous – as are all your creations! Enjoy London and your birthday. Happy happy birthday!!!! The dress is so beautiful!!!! This dress is really gorgeous and you’re looking so perfectly happy in it. 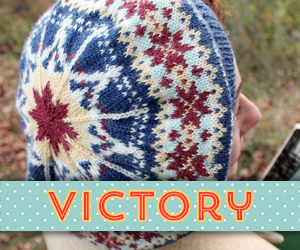 I just started sewing and your projects are very inspiring. It sooo nice sharing it to others, thanks a lot. And I’m very curious how your „new“ sewing space looks like – seen from the dress photos, it already looks very promising and well organized. Have a wonderful and happy birthday! That dress is just absolutely gorgeous! I’ve been thinking about sewing my own skirts and dresses for a while now but it still scares me so much. 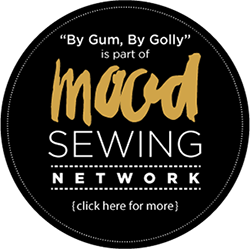 I’m not such a hero with a sewing machine (yet!) but you are so inspiring and I’m going to have to take the plunge at some time. Happy 40th Birthday and a great holiday in London! What a wonderful dress you’ve made, hope you can wear it a lot in the UK! 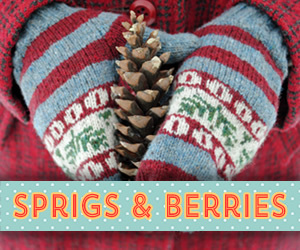 Are you going to visit a Cath Kidstone store? 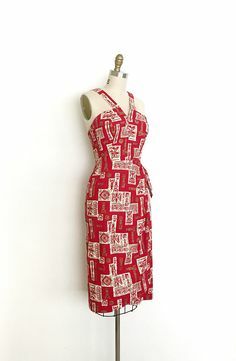 The fabric of this dress reminds me a bit of that gordious brand. 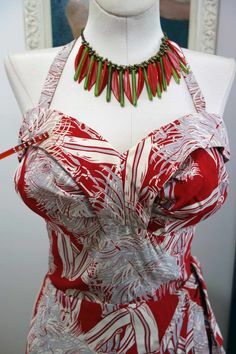 I think green heels would also look awesome with this dress. Happy birthday! What a gorgeous dress!! I just love the fabric you’ve used and it looks so good on you. I hope you’re enjoying your visit to the U.K.! Lovely dress, and I hope you had a fabulous birthday! Happy birthday! 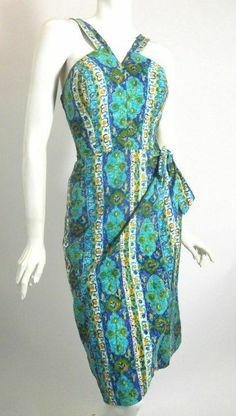 This dress is absolutely lovely, perfectly suited to a nice trip to London. I hope you have a wonderful time! Your attention to detail always seems to pay off in these gorgeous, original creations–how smart to think in advance about possible heavy skirt and other avoidable pitfalls and then to avoid them. I love the colour and design, like the most charming tablecloth or teacup in a very good way! ahaha! 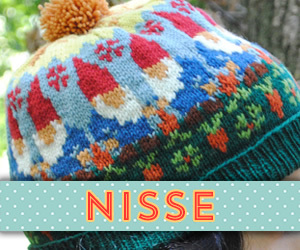 Wonderful use of the fabric – happy birthday! 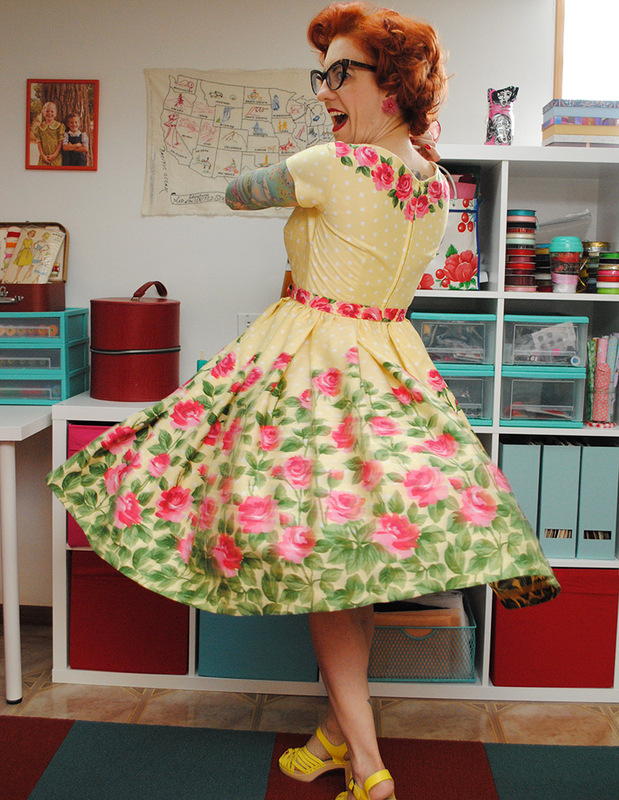 Your dress turned out AMAZING, Tasha! And Happy Happy Birthday! I hope you had an amazing day! I need to get the ball rolling on a Birthday dress for myself! 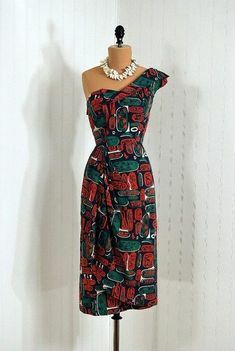 Beautiful dress, perfect pattern and use of the material. Happy 40th. 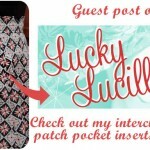 The dress is gorgeous – what a wonderful use of the print! Happy Birthday – enjoy London!!! Hope you’re having an absolute blast in London! What a wonderful dress! Love the way it turned out with the roses around the neckline 🙂 Have an awesome birthday! It looks amazing! 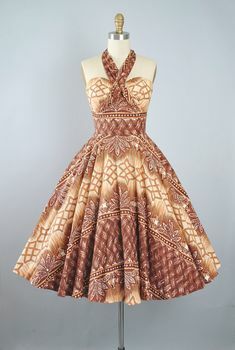 I love the way you’ve used the border prints and I imagine you’ll receive all manner of compliments about your gorgeous dress. Thanks for the tip about basting the darts – I’m starting to obsess over getting my darts just right and I think that’s a fantastic idea. 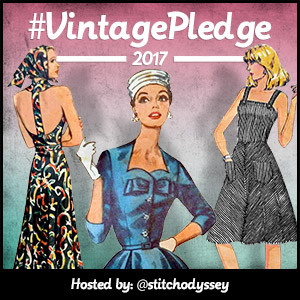 I’m not usually a fan of vintage, but somehow I came across your site and started looking through it. You are one extremely talented lady!! 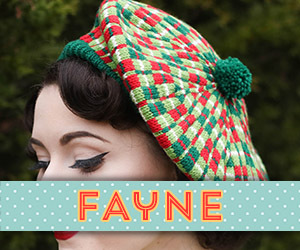 Absolutely incredible sewing and knitting projects. I love your unique look! Stunning and I always love how you guide people through how you made it. I always pick up so many good tips from you. Hope you had a fab time in London and on your holiday. 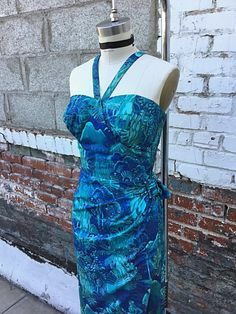 I’m currently planning my own 40th birthday trip away, I might steal your idea and make myself a birthday dress seeing as it’s 40! Happy Birthday! Thanks for the post! I always enjoy reading what you’ve written, and the pictures are great! Oooh, so pretty! Excellent use of the border fabric, and the belt finishes the look perfectly. Happy 40th! I hope you’re having a wonderful time in London. Happy birthday! Your new dress is beautiful. I admire your fitting skills! Looking forward to hearing about your London trip! Happy birthday! What a totally stunning dress. 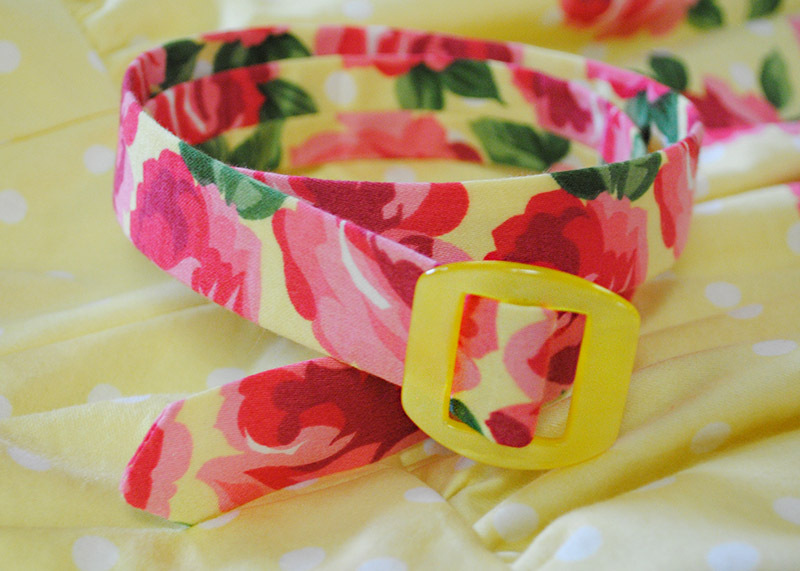 The use of the border print, especially for the belt, is brilliant! This dress is amazing and you look absolutely radiant in it! Also, I see I’m not the first to mention it but I really appreciate how the leaf print matches up with your tattoo! To die for. Happy belated! Hope you had a fabulous time (or are having!) Adorable dress! And this dress! Oh my goodness!! It’s too fabulous for words! 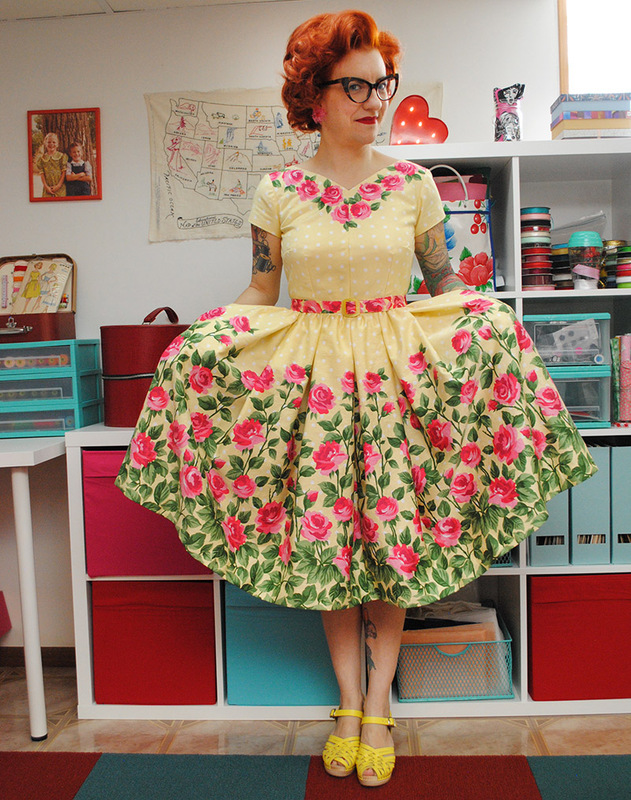 I love yellow and pink together, and this is just darling! Do love! The belt was inspirational! It really sets the dress off well. 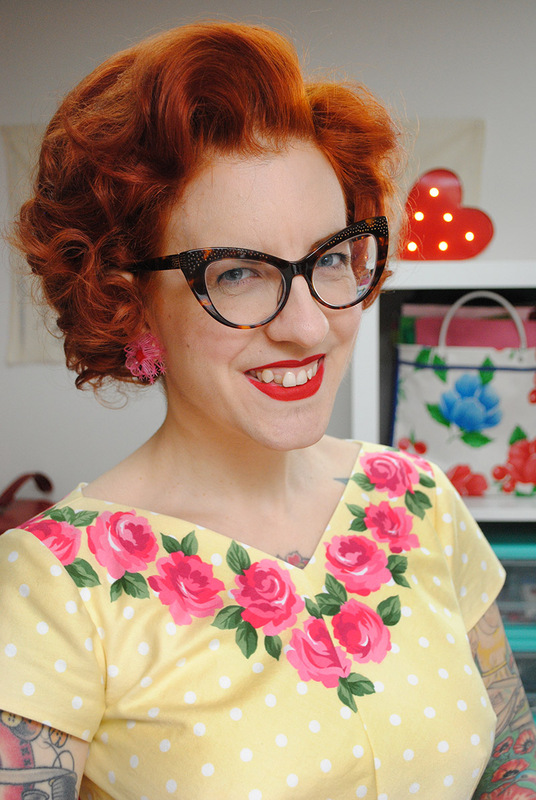 You couldn’t have chosen a better print and pattern for your birthday dress. Have a wonderful time in London! Hey Belated birthday wishes to you.. This looks really a birthday dress. 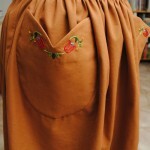 Planning to sew this for me and will love to wear on my birthday, i will be turning 38 :). 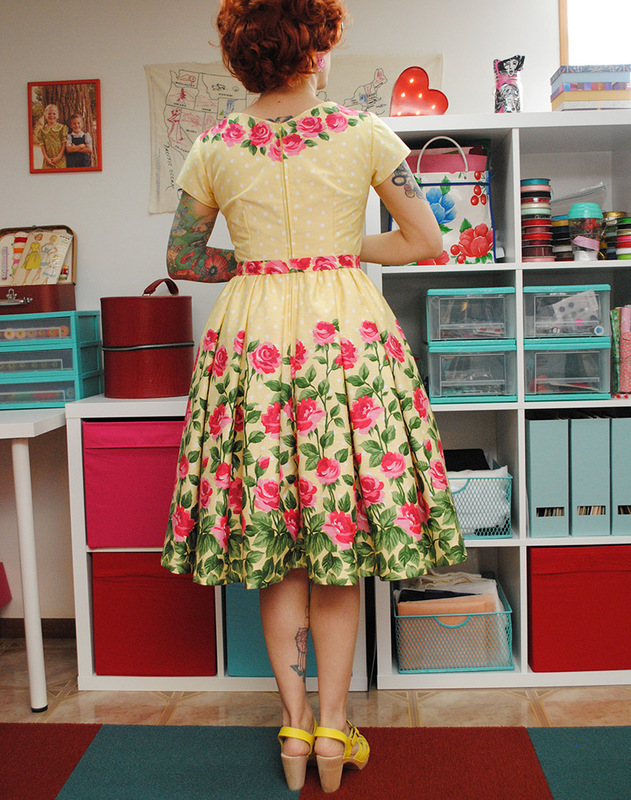 I would be making quarter sleeves as i am crazy for the sleeves dresses, may be because i am very thin. and you know your hairstyle is perfectly going with your dress. 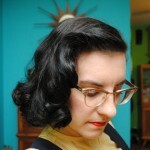 I have a long hair, but really want to try this dress with hair cut just like yours.. Thank you so much for sharing this.. I am working on my knitting projects and this floral dress will be the next project i will work on..
Love the dress & admire the skill you have in putting it together. 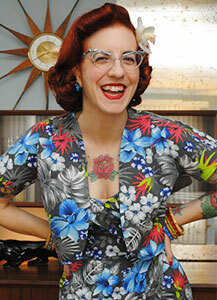 I’ve been using patterns from the 50s & 60s for blouses & pants, which are now back in style !! Don’t get rid of patterns. Happy belated birthday! I’ll bet that Gretchen is very impressed by what you did with her fabric. Marvellous! I have my Mom’s original pattern of that dress. I showed her your post and she loved it. She is also an April baby! She made hers 2 dresses from that pattern in a seersucker fabric. She wore a blue one to a school dance. Hey, just found your website and couldn’t not comment on that dress! IT IS GORGEOUS! Happy belated birthday to you! 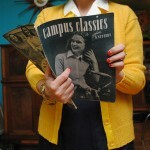 JUST CAME ACROSS YOUR BLOG AND REALLY REALLY ENJOYED IT!! 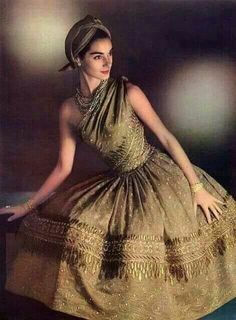 YOUR POLKA DOT DRESS IS TO DIE FOR..I WOULD LOVE FABRIC LIKE THAT BUT NEVER SEEM TO COME ACROSS ONE WITH A BORDER LIKE YOURS, OR ELSE THEY COST A SMALL FORTUNE..
AS I AM NOT AN ACCOMPLISHED SEWER, I WOULDN’T BE ABLE TO AFFORD THE HIGH COST, ONLY PERHAPS TO RUIN IT!! My first big sewing project was in high school out of that pattern, out of a copy my grandmother had that I found after she passed away. It’s in a much too garish blue, and not really a style I wear in my everyday life, and it took me an entire summer to make, but I’m so glad I did. My grandmother was very talented, and probably made the dress for one of her sisters. Your dress looks gorgeous!